Let’s take a short trip on the wayback machine, pausing at September 2 and August 27 2015. The subjects, the acceptance and then sending back the contract for a new story, “The Re-Possessed” about a deal gone bad for an undertaker in Victorian London, for an also new anthology titled CEMETERY RIOTS. Flash forward to now (or actually yesterday, Wednesday, by now) and comes an update from editor T.C. Bennett, that the anthology is on target for publication in June, and could I send a current biography? And also a suggestion I check co-editor Tracy L.Carbone’s website for a list of authors selected thus far. This stellar anthology is coming out in June of 2016 by Awol from Elysium Press a.k.a. T.C. Bennett. I’ve been excited to edit this with him as I’m seeing some fantastic talent come across our virtual desks. The stories are strong, character driven, good old fashioned horror. Cautionary tales that will stay with you long after you have finished reading. We’ve got some great stories from seasoned bestsellers and brand-new fiction writers. . . .
and works in progress from several others that will be added here very soon. 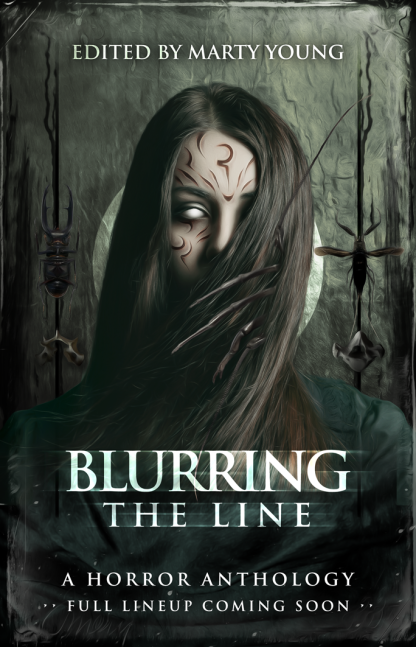 So says Editor Marty Young of Cohesion Press’s BLURRING THE LINE (see below, November 22 et al.) in the first of a daily series of interviews of the anthology’s authors. That is, look for mine in a few days too! But for now, the lead interview also marks the promised November 26 publication date of the book as well, at least on Kindle, with the print edition to follow soon. And so, to hear from the horse’s mouth (in a manner of speaking) just what the book’s all about, readers may press here. And if you like what Marty has to say, Amazon’s page can be found here. It also brought sunshine and low-to-mid nineties heat — summer had come at last! — with the only rain Sunday, literally, just a few drops. And that came just after my reading had ended. Could that have been a message? Well, probably not, but mine was the only presentation listed as a reading of horror. This was on the Spoken Word Stage presented by the Writers Guild at Bloomington (cf. July 26, May 31, et al.) with partial support by the Bloomington Arts Commission, as part of Saturday and Sunday’s annual local 4th Street Arts Festival. This is something the Writers Guild has participated in for the past five years, including an information table, a “Poetry on Demand” station (with donation jar) where member-poets create poems for the public with final drafts done on manual typewriters (and, no, given the subject matter of so much of my work, this is one I don’t participate in), and the aforementioned Spoken Word Stage with work read by local and semi-local poets and prose writers in half-hour sessions. The sessions I got to I thought were fun, with poets perhaps outnumbering the essayists and fiction writers more this year than in years before, but in general giving a good idea of the range of writers and work produced locally. Mine was the one session actually labeled by genre, as “horror fiction,” which might have kept the hypothetical crowds at bay, though it was more likely that I had the next-to-last Sunday, 4 p.m. slot (that is, when people were starting to call it a day, stopping by perhaps to rest their feet, we being one of the few venues there with a sunshade and chairs, rising again on realization of what they were hearing and scurrying all the faster to their cars — would that we writers actually had that kind of power!) and, in any event, some people did show up and stayed for the stories. And so, I opened with “The Calm” (cf. below, October 5 2014, et al.) from my early collection, STRANGE MISTRESSES: TALES OF WONDER AND ROMANCE, a Lovecraftian tale set in northern New York at the time of the French and Indian War, originally published in NEW MYTHOS LEGENDS (Marietta Publishing, 1999). This ran perhaps a little longer than I had rehearsed, though it might also be that we started a couple of minutes late, but not to worry. For my closing story I had pre-selected two, both from THE TEARS OF ISIS, anticipating perhaps a time problem (things running a couple of minutes late at events like this is not exactly unprecedented) and so chose the shorter, “Bones, Bones, the Musical Fruit” (cf. March 29, January 26 2014, et al. ), originally published in BONE BALLET (Iguana Publications, 2005) and concerning the problems endured by artists who craft musical instruments from human bones. It all seemed to go over well enough. 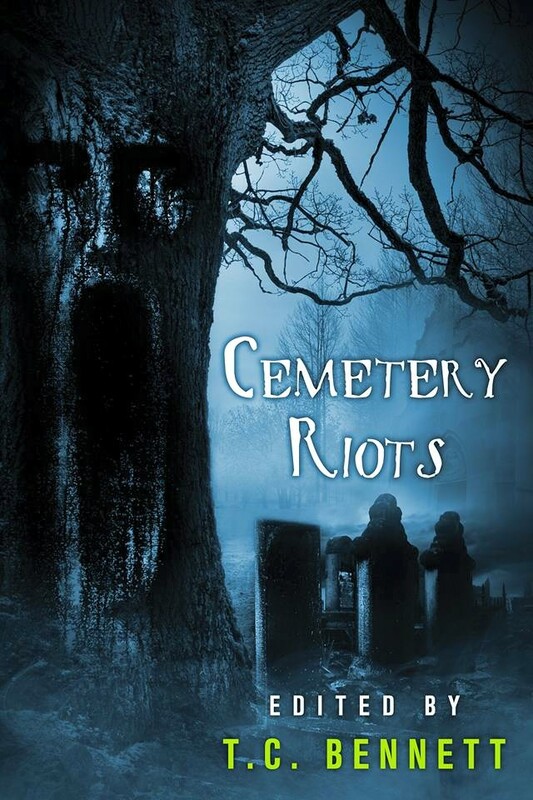 The anthology’s name is CEMETERY RIOTS, though, ghostlike, it seemed to lurk in shadows. There has been a note and cover picture on Editor Chris (“T.C.”) Bennett’s Facebook wall since about the second week of June and a web page probably in the near future. Yet there was an air of mystery when I recei ved a “request to moderate” from WordPress concerning a comment on one of last week’s posts. It turned out not to actually be a comment as such, but rather means of contacting me with an invitation to submit. There was a note concerning the Facebook page and a tentative publication date for early to mid 2016, plus word count limitations and info on payment. And there was an email for further contact. So, intrigued, I checked out the picture and some other info, then emailed with some content-related questions. The answer to that, in effect, was pretty general “as long as it’s horror,” as well as some details on formats and files. Also there might be more anthologies coming in the future. So why not, thought I? A few days later I emailed a tale called “The Re-Possessed” about, keeping the CEMETERY RIOTS title and cover in mind, an undertaker’s arrangements gone wrong in Victorian London. Then this afternoon the answer came: “I received your story. Love it. Sending out contract and payment.” So the moral, I suppose, is it’s always a good idea to follow up on mysterious emails. Latish this evening the contract came from Cohesion Press for my story “The Good Work” for publication in BLURRING THE LINE (see February 7). This is the Australian anthology that asks the question “Do you know what’s real and what isn’t?” So concerning my story, one might consider wheth er there were witches in 1850s London. And if there were witches, then what of witch hunters?